The concept of diversification is vital to investors: Don't put all your eggs in one basket so they won't all get smashed if you trip and fall. It's better to spread your wealth over a broad financial spectrum of investments, but avoiding pitfalls isn't as intuitive as it may seem. Diversification neither assures a profit nor guarantees against loss in a declining market. This is especially important to remember when stocks are soaring and portfolios can get overloaded with stocks and human nature is to get greedy and overly optimistic about a continuation of the current trend. Retirement investors sometimes think broadening asset allocation is as easy as plunking 401(k) contributions into a fund investing in the Standard & Poor 500, which is called a "broad market index." But 500 stocks is not a diversified portfolio. It diversifies exposure in a single asset class - namely, large U.S. companies with a market capitalization of more than $10 billion. That's not a broadly diversified portfolio. In 2008, when the financial crisis hit, many investors held portfolios loaded up on U.S. stocks. That year, the S&P 500 fell 38%. If more of their holdings had been in bonds, particularly U.S. Treasurys, the crisis would not have hurt their portfolios as badly. The Bloomberg Barclays U.S. Aggregate Bond Index, representing U.S. Treasurys, corporates and other investment-grade bonds, gained almost 6% in 2008, as stock investors scrambled to a less risky place for their money. Diversification is like salsa. You can't make it with tomatoes alone. You blend in onions, garlic, cilantro and jalapeno to create the right recipe for you. Diversifying requires adding more than large-cap stocks. The classic meat and potatoes portfolio of stocks and bonds became popular in the 1930s. The same way we've learned since then that adding vegetables and salads improves your odds of good health, increased understanding of finance tells us adding additional types of assets to a portfolio improves the odds of a retirement portfolio surviving longer. 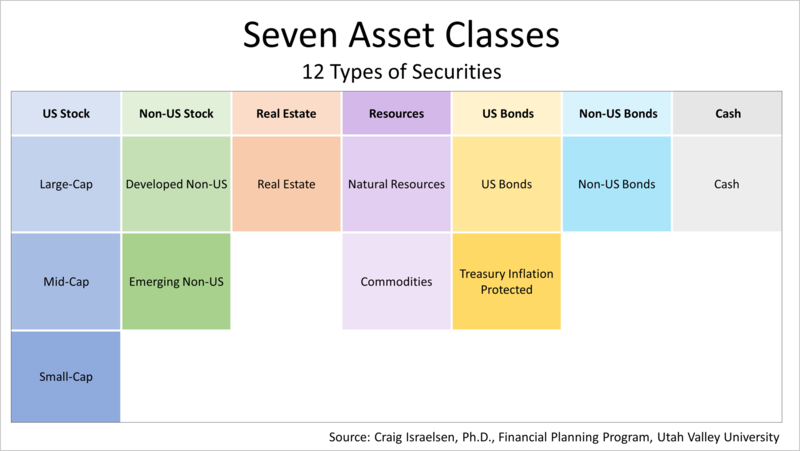 A portfolio spanning seven asset classes and allocated equally across 12 different types of securities provides an example of the rigor, discipline, and wisdom of diversification. Stock mutual funds or exchange-traded funds diversify a portfolio across indexes of large-, small- and mid-sized companies, as well as different types of bonds. Funds and ETFs, whose holdings mimic indexes to represent broad categories of stocks or bonds cost about 1% a year less than an actively managed mutual fund or ETF. Saving 1% in investment expenses may not sound like much but, it adds up over the long term, due to the magic of annual compounding once hailed by Albert Einstein "as the eighth wonder of the world." 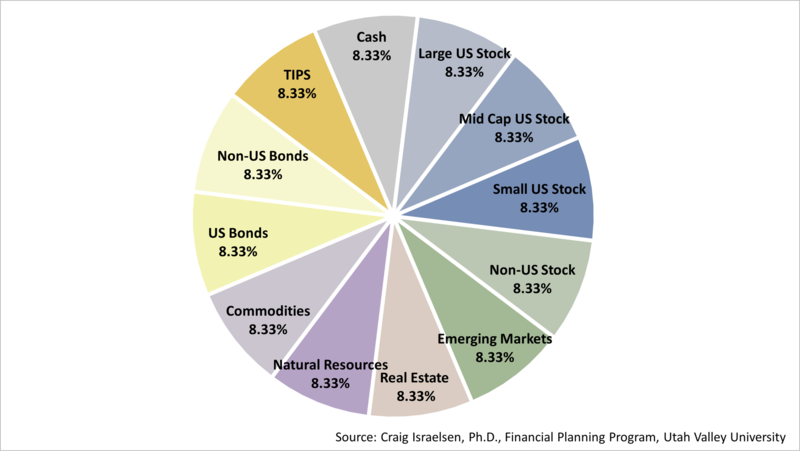 Another way of looking at a diversified portfolio is as a pie apportioned in slices. In this example, the portfolio is comprised of 12 equal slices of different types of securities. In practice, the apportionment can be tweaked to suit your risk tolerance and personal taste. Periodically, one component of your portfolio is bound to outperform its historic norm. An 8.33% position grows in value to represent 10%, 12%, or more of the total portfolio and other allocations shrink. Correcting these imbalances periodically recalibrates your portfolio to your goals and preferences. Rebalancing is another mathematical wonder. The bottom line is that a low-expense quantitative discipline for managing a portfolio, when combined with personal financial planning to pay for long-term goals, does not guarantee you will get everywhere you want to go in life. But it gives you a clear road map to improve your chances for getting there.